This five sided Star tamperproof bit set is supplied complete with socket rail. TS10, TS15, TS20, TS25, TS27, TS30, TS40. Now a popular security fastening on Renault | Peugeot | Mercedes-Benz. Other fixings include air conditioning units | diesel injection pumps and engine control units. Bit manufactured from Silicon Steel, socket in Chrome Vanadium. 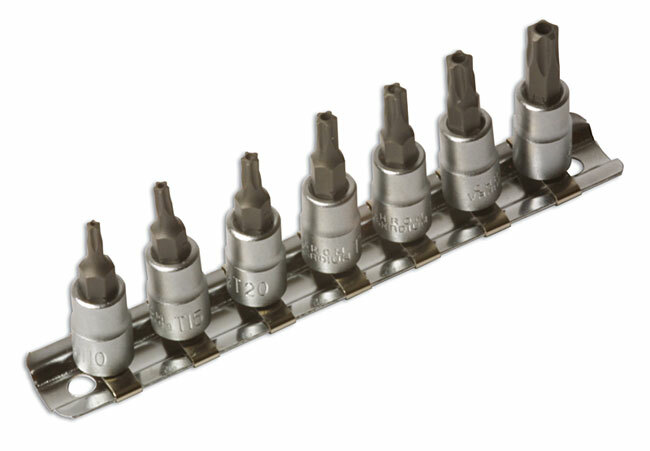 Embout Torx percé : TS10, TS15, TS20, TS25, TS27, TS30, TS40. Particulièrement populaire sur Renault, Peugeot et Mercedes. Des applications courantes sur les climatisations, les pompes à injection et les calculateurs.